Jack might be the only kid in the world who's dreading summer. But he's got a good reason: Summer is when his single mom takes a second job and leaves him at home to watch his autistic kid sister, Maddy. It's a lot of responsibility, and it's boring, too, because Maddy doesn't talk. Ever. But then, one day, she does talk. 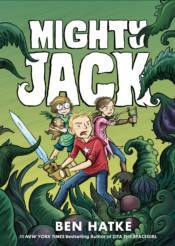 Maddy tells Jack in no uncertain terms to trade their mom's car for a box of magic beans. It's the best mistake Jack has ever made. The little garden behind his house is about to become home to tiny onion babies running amok, dangerous biting cabbages, and, in a fiery cliff-hanger at the end of this first volume: a dragon. Available in Softcover and Hardcover editions. AXCEND VOL.01: WORLD REVOLVES AROUND YOU SOFTCOVER BABY SITTERS CLUB VOL.05: DAWN & THE IMPOSSIBLE 3 - COLOUR ED. BAD COMPANY: FIRST CASUALTIES SOFTCOVER BAD MACHINERY VOL.01 POCKET ED.